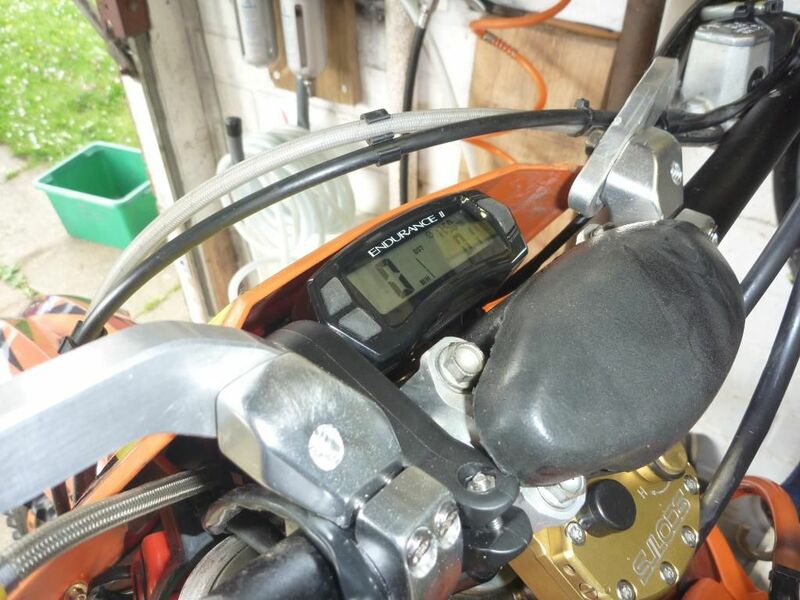 Speedometers are pretty handy things to have on a motorbike. In fact they are more or less an essential item to ensure you stay within the legal speed limit. Not only that but they are pretty handy tool to show you how far you can travel on your tank of petrol. 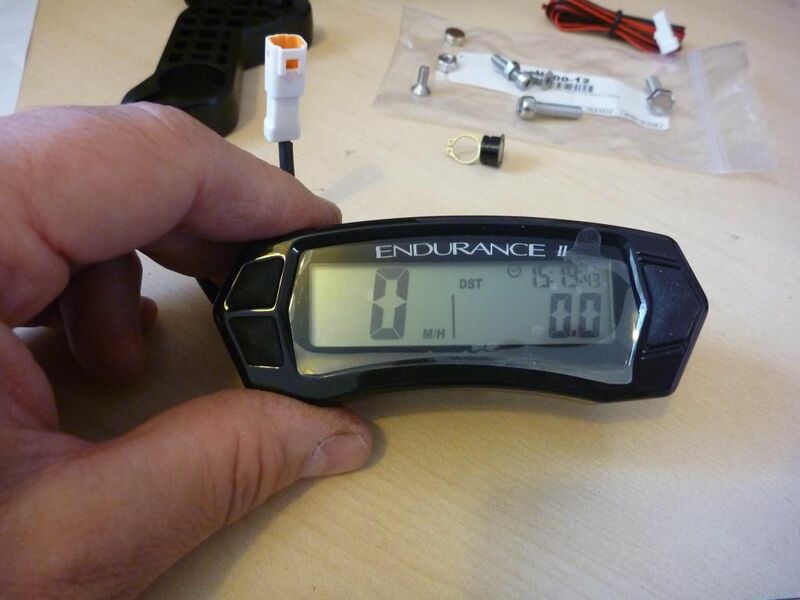 So it always amazed me why the majority of Japanese enduro bikes come with only a trip counter (if you’re lucky). On the flip side the European bikes i.e. KTM come with an brilliant little speedo unit that does all sorts of fancy measurements for racing along with the obligatory measurement of your speed. The only problem with the ktm units is that they can stop working after a few years and they require open dash surgery with a can of electrical cleaner to get the button to work again. Of course the cross country models in KTM’s range are cut to the bone bikes so they don’t come supplied with the enduro dash. Seeing as I’m in the market for a XC bike now, I was wondering how to get round this and starting to look at the cost of original equipment clocks. 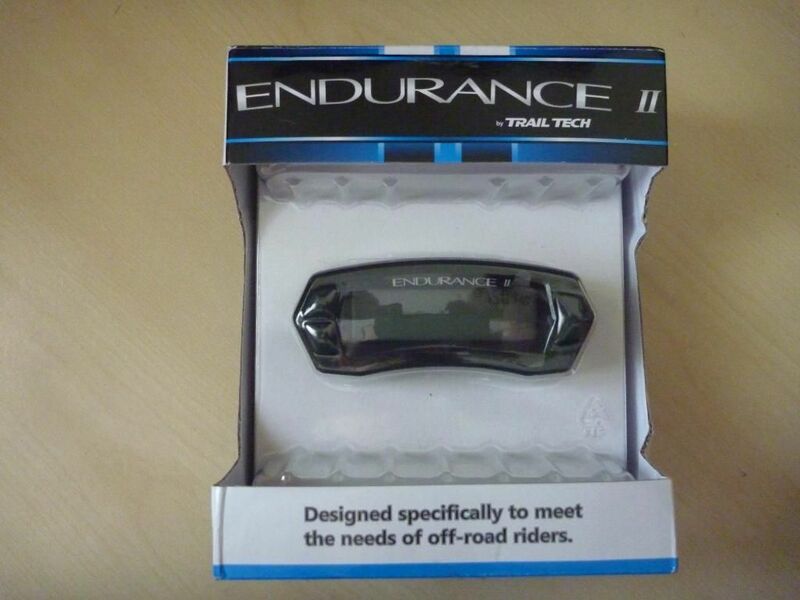 So you can imagine my surprise when I was offered a pre-production model of Trailtech’s new speedo unit for review purposes. The unit was supplied with a KTM fitting kit and I was pleasantly surprised to find that it came with everything that you could possibly need to fit it to the bike, including brackets, a magnetic pick-up and three different magnets for various setups. Holding the unit itself in my hand it feels like a good solid bit of kit with a positive action to the buttons and a clear display. I was initially a little sceptical about the plastic brackets supplied to hold the unit to the bars, though this turned out to be unfounded. Fitting the unit to the bike was so simple it took zero mechanical skills. Tighten the speedo into its holder with two screws. 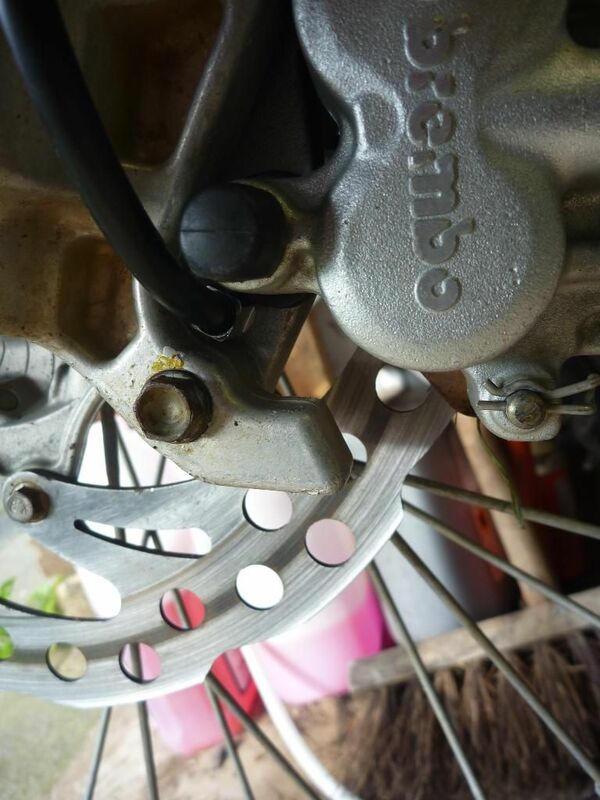 Slip the bracket over the bars and fix the unit to the bracket and there you are - one aftermarket speedo sitting neatly in the place of the original unit. In fact it fits so well it could easily be mistaken for ‘factory fitted’. It certainly looks the part compared to the naff bicycle units you see fitted to some bikes. the new unit sitting above the OE KTM dash. Next up you need to fix the magnetic sensor into place and the power lead for the backlight. 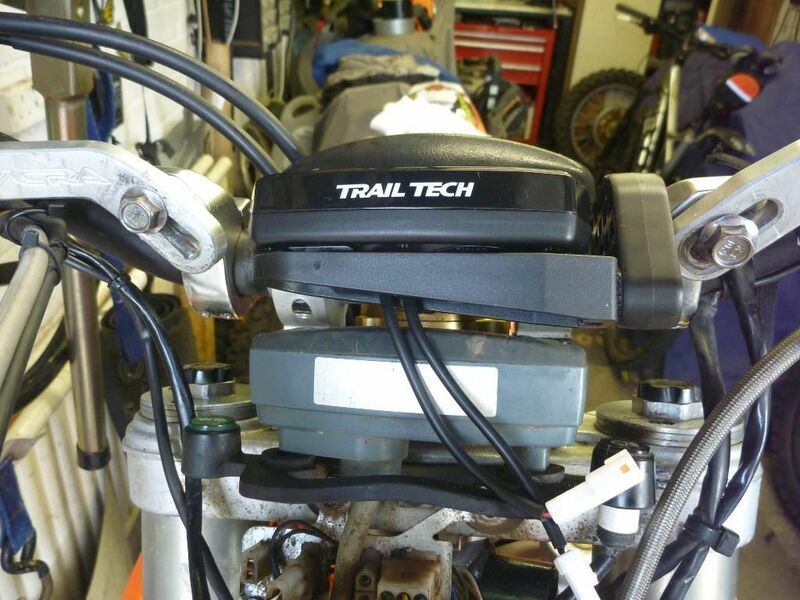 The sensor unit was a straight swap for the KTM part. 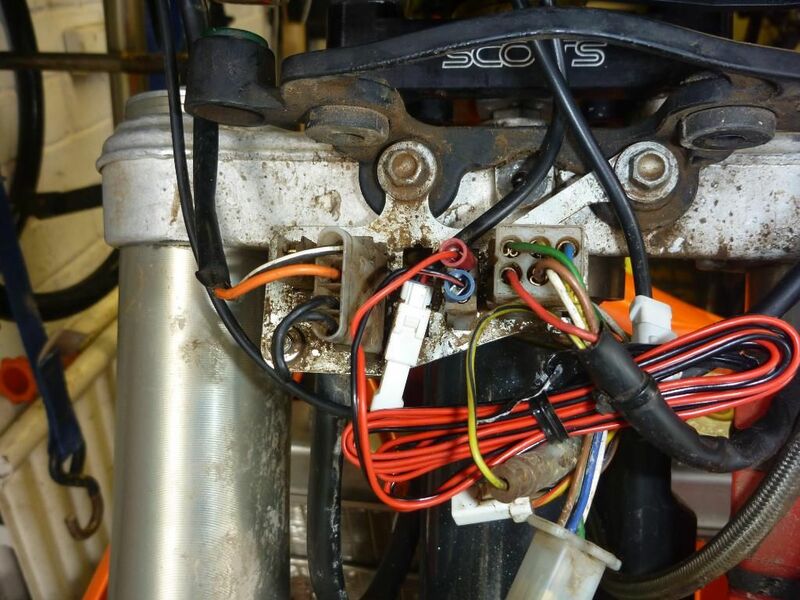 Disconnect the KTM sensor behind the headlight cowl. Unscrew it from the brake bracket and then screw the Trailtech one into its place (at the brake) and plug the other end into the new speedo. If you want the backlight to work when it operates then the supplied cable needs to have an un-switched supply. As luck would have it there was an unused plug behind the headlight so a couple of spade connectors later and the job was finished. One final task to get it all working was to set the wheel size and time etc using the buttons on the front of the speedo and that was that. The unit has several different modes and two trip counters. 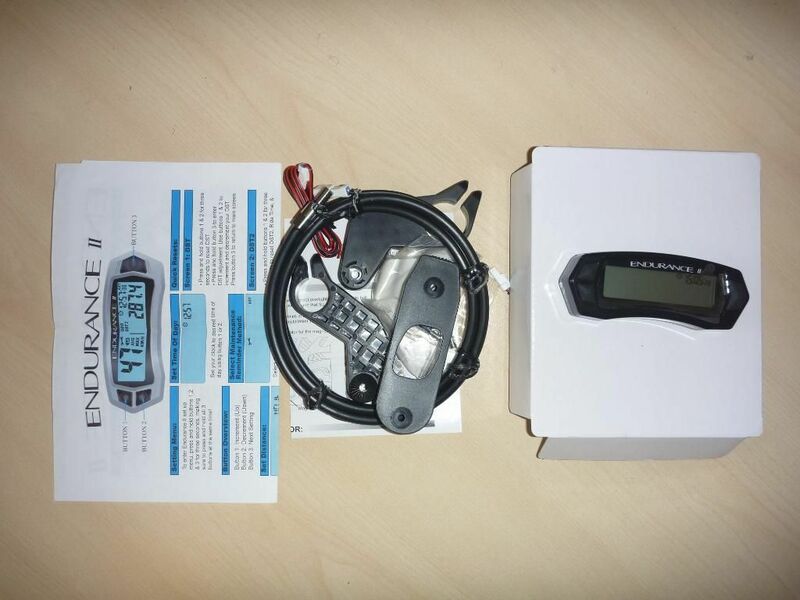 It also has the ability to measure your usage for maintenance purposes and the service reminder can be set to measure hour's run or distance traveled. So very easy to fit, looks good and the best bit is that I’ve been told they are going to market it around the £60 mark so compared to OE KTM parts it’s a bargain, as a quick look on-line has the pickup cable and speedo alone priced at over £200! Reference the power supply (i've have a few queries) it works off a battery and will do so no problem. The display goes into sleep mode if it not used for a while and then fires into life when you press button or the wheel turns. If you want a backlight ie at night or just a little clearer in the day then connect up the power supply and when the wheel turns it fires up the light, which then switches off after 90 sec of inactivity. I’ll be playing with it this weekend so we’ll see how stands up to being hammered around an enduro loop all day. The only downside I can see so far is the lack of an independent stopwatch facility, although it does have a ‘trip time’ function that could be used as one. But for racing purposes I would have liked to see a stopwatch function separate to wheel turning time so you can use it during H&H events. Well it spent the whole day being hammered around an enduro loop at flat out speed (surviving several tumbles) and it's still in one piece. So there's not much more to add really. The clock was handy for keeping an eye on the time during the day, especially near the end of the day so we could get in several laps before the track closed. The top speed recall was useful too when a youngster asked how well the steering damper on my bike worked, as i could tell him what speed i was doing on the day across rough ground. Like i said earlier, the only thing I'd like to see is a stopwatch based on actual time not a run time - other than that it's a fantastic bit of kit and i can see it being a big seller to trail riders and racers alike. Power washing - well this is never recommened...... but today i washed the bike after a hellish muddy ride on sunday and it stood up to the 110 bar washer ok - another plus point!